The Philippines is the fastest growing market for smartphones in the whole of Asia Pacific -- so it's no wonder that many handset brands are now doing the best they can to woo Filipino consumers via various marketing efforts. 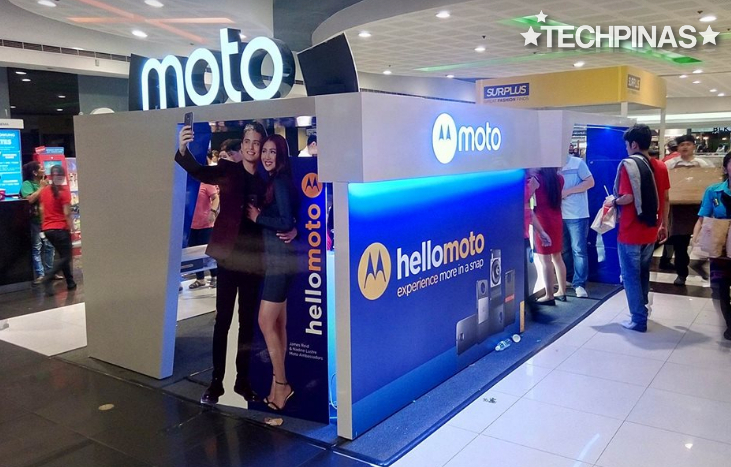 Last October 20, 2016, Motorola Philippines officially introduced their latest celebrity ambassadors, James Reid and Nadine Lustre, as well as their updated product line-up through a landmark event held at The City of Dreams Manila. 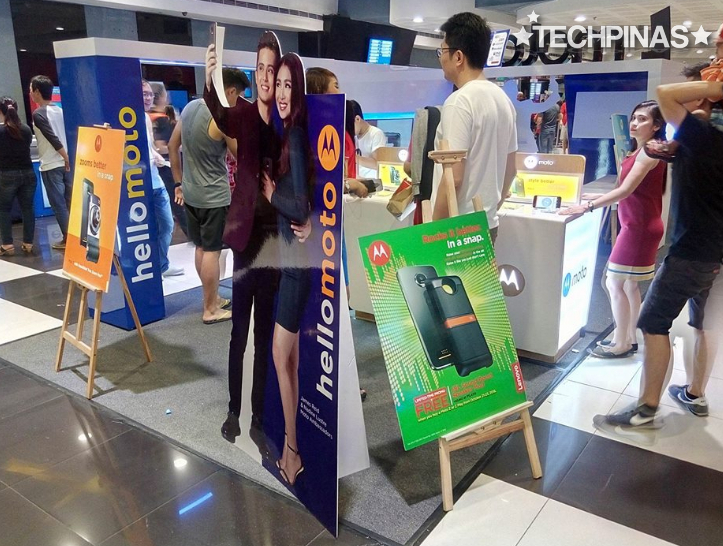 A few days ago, the company - via Lenovo Philippines - has also started setting up experiential booths in various malls around the country to let consumers try out their smartphones more extensively. Talk about going all out! This Moto Hub at SM North EDSA CyberZone was spotted by TP Friend Charles Quiachon last week. I would like to give him credit for all images I used in this entry. If you've always been a big Motorola fan or if you're one of those who are starting to get curious about what the company has to offer this year, here are three Moto phone models that are already up for purchase nationwide. 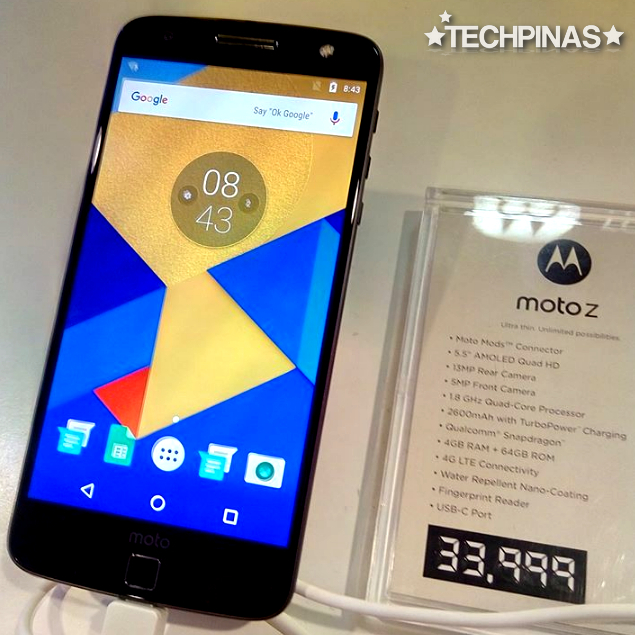 Donning an SRP of Php 33,999, the Moto Z is the flagship level release of Motorola Philippines for Q4 2016. Basically, it's a water-resistant modular handset - supporting a couple of snap-on extensions at the back - with top-notch technical specifications. This smartphone is equipped with a 5.5-inch 1440 x 2560 pixels AMOLED display, a 13 MegaPixel autofocus f/1.8 main camera, 5 MegaPixel f/2.2 front cam for selfies with Soft LED flash, USB Type C port, Fingerprint Scanner below the display, 4G LTE support, and a non-removable 2,600 mAh battery pack. Under the hood, it runs Android Marshmallow OS with beastly Qualcomm Snapdragon 820 processor, has 4GB of RAM, and comes with 32GB of internal storage. Moto Z Play also supports Moto Mods (snap-on extensions) but it has less powerful internal hardware compared to Moto Z, which makes it more affordable at Php 22,999. This one has practically the same screen, imaging capabilities, 32GB of internal storage, and shell with water-repellent nano-coating of the Moto Z. However, it is only powered by a 2GHz Octa Core Qualcomm MSM8953 Snapdragon 625 processor and has 3GB of RAM. Nonetheless, it has a big battery pack with 3,510 mAh capacity. One Moto Mod that you can get for both Moto Z and Z Play is the Hasselblad TrueZoom Snap-on Camera, which brings brings 10x optical zoom, Zenon flash, and RAW image capture support to these already capable cameraphones. 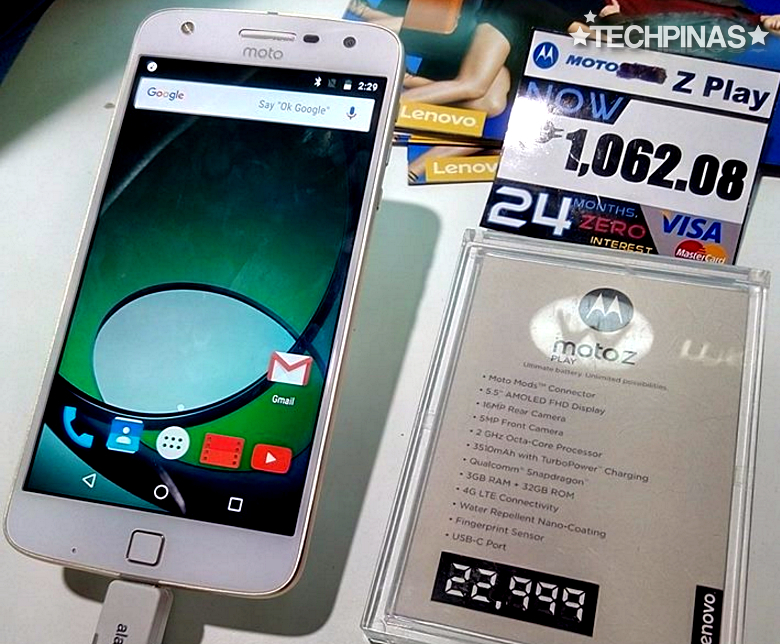 Currently, Moto PH offers this add-on for Php 14,099. There's also the JBL SoundBoost loud speaker mod that goes for Php 5,499. 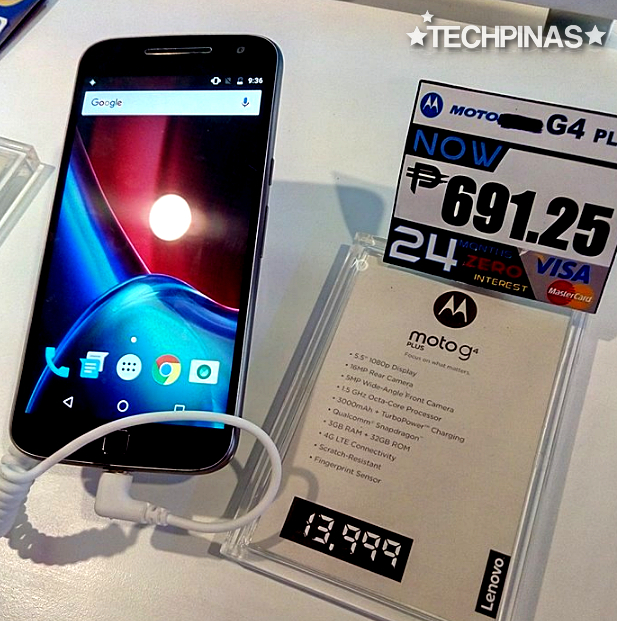 And finally, the most affordable of the bunch is the Moto G4 Plus, which goes for only Php 13,999. At thatr amount, I think it's a good purchase -- at least, considering its technical specifications. This relatively budget-friendly phablet sports 5.5-inch Full HD IPS display that's protected by scratch-resistant Gorilla Glass 3, a 13 MegaPixel autofocus camera at the back with f/2.0 aperture and Dual LED flash, 5 MP f/2.2 wide-angle selfie cam in front, Full HD 30fps video recorder, Dual SIM Dual Standby capability (Dual microSIM), 4G LTE Cat4 support, and 3,000 mAh battery pack with TurboPower Charging support. At its heart, Moto G4 Plus runs Android 6.0 Marshmallow OS with an Octa Core Qualcomm MSM8952 Snapdragon 617 chipset, has 3GB of RAM, and comes with 32GB of internal storage that's expandable via dedicated microSD card slot. As I've said, you can give all these smartphones a solid test run at the Moto booths found in leading malls across the country. You may proceed to purchasing them at those hubs or at all Lenovo Concept Stores and authorized retail outlets nationwide.